Terrell “T-Rex” Simon began professionally singing in 2003 as a background singer with platinum selling singer – songwriter / producer Lyfe Jenning. He tour with the greatest such as John Legend, Beyonce, Anthony Hamilton, and Musiq SoulChild. His natural church boy upbringing has brought him to a place in his singing career where he infuses rhythm and gospel without compromising the word of God! While some vocalists start out with early music instruction, others hone their craft purely off the soul of the church. One such powerhouse is Troy, NY native Terrell ‘T-REX’ Simon, who at the age of six discovered his gift while singing in the choir. As a vocal prodigy, his popularity grew and he started touring with the choir, learning how to deliver energetically before an audience. Knowing music was his passion; he decided to make a career of it, even moving away from his family upstate to get his professional start in New York City. As he gained more exposure, he stayed on the road with a traveling choir, and eventually settled in New York with some of the members as roommates. At a Mary J. Blige concert, he spotted instrumentalists from his church performing with her and afterwards mentioned to them his interest in doing background work. In 2003, those connections led him to the platinum-selling singer-songwriter/producer Lyfe Jennings, who loved his voice enough to take him on the road with his act. Although it was the first time T-Rex had actually sung secular music, Jenning’s messages were so inspirational it wasn’t a major departure from his gospel performance—only now on bigger stages, nationally. After sharing stages with everyone including Wyclef Jean and Mario, T-Rex took to management of artists with ease. Beginning as manager for Lyfe Jennings, and road managing Shaliek; he mentored and developed him and other talents like Day26, as he moved further behind the scene. Once caught up in the business side of the industry almost exclusively, he was content being around the music he loved without the pressures of performing—until he had a dream. In 2015, one inspired him into knowing it was time to put his own music out. “I knew I had something to touch and help a lot of people with and that it was wrong for me to hold that back“, he stated. To this mission he brings his own musical genre, ‘R&G’ for rhythm and gospel, which beautifully infuses his natural church boy upbringing with his love of Hip Hop. His first single, “In His Image” is already in rotation at Music Choice and gaining more radio play daily. The song’s immediate appeal points to the start of something that began in a dream and is now a fast growing musical phenomenon (exampled by 54,000 Instagram followers within the first days of its release). His music is featured on Amazon by Devine Jamz, available on digital platforms such as Spotify, Pandora, iTunes, iHeartRadio, XM Satellite, and SoundCloud. 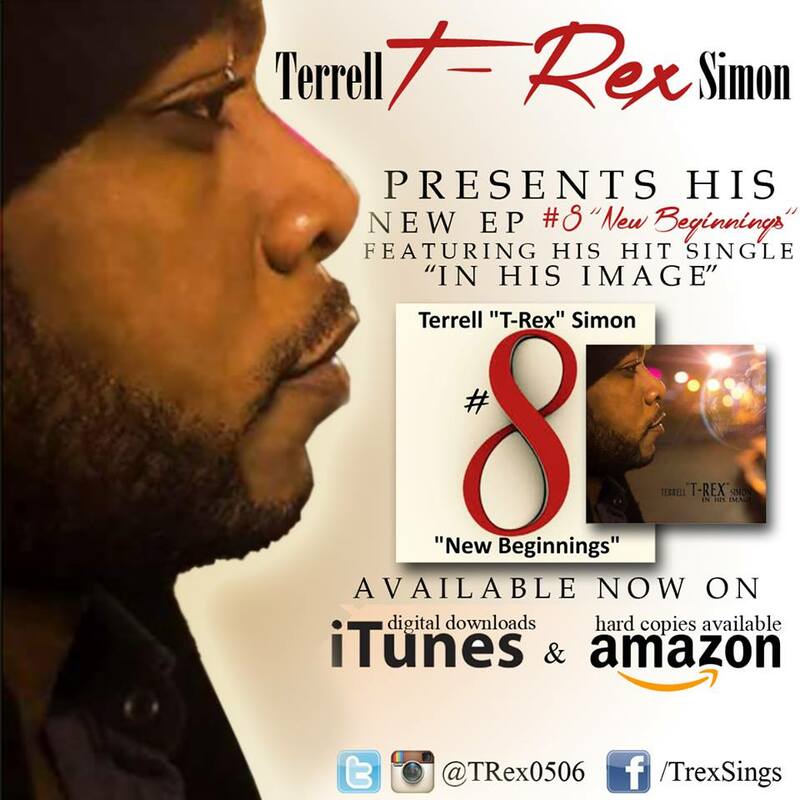 Information on Terrell ‘T-REX’ Simon’s tours, single releases, and more can be found through his Management by Nichole Danielle and through the marketing team at Devine Jamz Gospel Network.